The 'Fixed Deadline' feature provides you with an additional option for visualizing delays that could have a negative effect on the finish date of your project. This feature is useful if the end date of your project marks a fixed deadline. Delayed milestones or activities that lie outside of the planning period are highlighted in an orange shaded field in the project plan. 1. Start from the project overview: To create a new project click in the ribbon on the Start tab and on New Project. Or double click to open an already existing project. 2. Activate the 'Fixed Deadline' feature in the management view on the Edit tab. 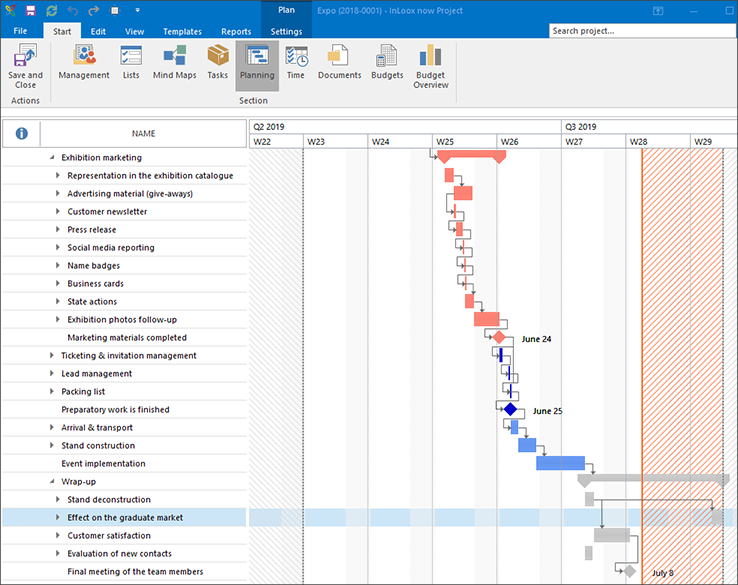 The feature highlights all activities that are delayed beyond the project end date (specified on the management page) in an orange shaded field in the planning. See at a glance whether the project can be completed on time or whether delays have negative effects on the deadline. 3. You can activate or deactivate the feature at any time in the management view of your project. Fixed Deadline • Copyright 1999-2019 © InLoox, Inc. All rights reserved.